For nearly a year, boxing fans have salivated at the possibility of a middleweight championship match between WBC title-holder Miguel Cotto and Canelo Alvarez. It's now closer to becoming reality than ever, but, as is typical in boxing, there is a dispute between the sides as to how close it is. 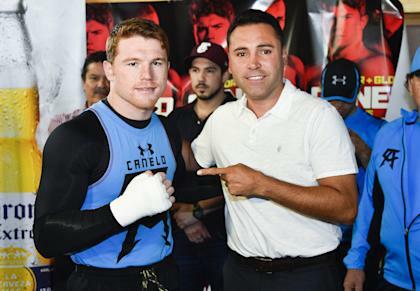 Alvarez promoter Oscar De La Hoya of Golden Boy said all details are completed except terms for a rematch clause. He said the bout is set for Nov. 21 at the Mandalay Bay Events Center in Las Vegas and will be shown on HBO Pay-Per-View. But Cotto attorney Gaby Penagaricano disputes De La Hoya's contention and says there are other outstanding issues. However, Penagaricano said he didn't think there were any insurmountable obstacles. De La Hoya, who had hoped to make Cotto-Alvarez for May 2 before finallly giving up when he couldn't reach a deal with Cotto, pointed the finger squarely at Penagaricano as the obstacle. De La Hoya said he's in agreement with Roc Nation Sports, Cotto's promoter, on all issues. "Basically, Roc Nation is on board, Golden Boy is on board, Mandalay Bay is on board for the 21st, and all we're waiting for is Gaby," De La Hoya told Yahoo Sports. "We've made all the concessions they've asked of us to make this fight happen. All we're doing now is waiting for Gaby and Cotto." De La Hoya said the final remaining obstacle was an issue that had to do with a rematch clause. He didn't want to elaborate on exactly what the dispute over the rematch clause was, but he insisted that was the sole outstanding issue. Yahoo Sports contacted Penagaricano, who had just boarded a plane in Mexico bound for Miami. He sent a brief response via email, and said he would answer questions when he landed. "I can tell you that the information is absolutely not true," Penagaricano wrote to Yahoo Sports. "There are still several things that are pending to be completed that have nothing to do with the deal between the fighters for the event. Currently, I see no impediment for everything to be concluded. But the whole deal for the event, with all of its components, will be done when it's done. As of this minute, it is not done." De La Hoya said he's anxious to seal the deal and begin a tour to promote the fight. He believes it will be the biggest pay-per-view of the fall and said he expects it can sell as many as 1.5 million units. But with a Floyd Mayweather pay-per-view bout on Sept. 12 on the verge of being announced and a Gennady Golovkin-David Lemieux match for October already have been set, there is a lot of competition for the boxing fans' attention. So De La Hoya wants to strike as quickly as possible. Jay-Z's company, Roc Nation Sports, promotes WBC middleweight champion Miguel Cotto (Getty Images). Roc Nation Sports, owned by music mogul Jay Z, has never promoted a major fight before. De La Hoya said he wants to get moving to guarantee Roc Nation doesn't lose a lot of money on the deal. "We have time, because the fight is not going to be until Nov. 21, but Roc Nation has a lot of pressure on them," De La Hoya said. "The more we wait, the less promoting we can do. And look, it's no secret that Roc Nation put up a big guarantee. So what I want to do is to get the ball rolling so we can promote the heck out of this fight and make it the biggest fight of the year." De La Hoya said "a lot of people are frustrated" at what he called Penagaricano's stalling, though he took pains to emphasize that he believes the fight will happen. He said the delay is simply decreasing the odds that he'll be able to maximize the fight's revenue. "I can wait right up until the deadline, which is maybe month," De La Hoya said. "But I want to make sure Roc Nation doesn't lose their shirt on this. I want to get the ball rolling. I have some terrific ideas about how to promote this fight, and we have a lot of great sponsors lined up. We want to make this the biggest fight of the year and the longer we wait to get started, the worse it is going for the whole promotion."